As in large parts of the US, it has been bitterly cold here in Maryland. The bird feeders in the yard are hopping with birds, as are the birdbaths. 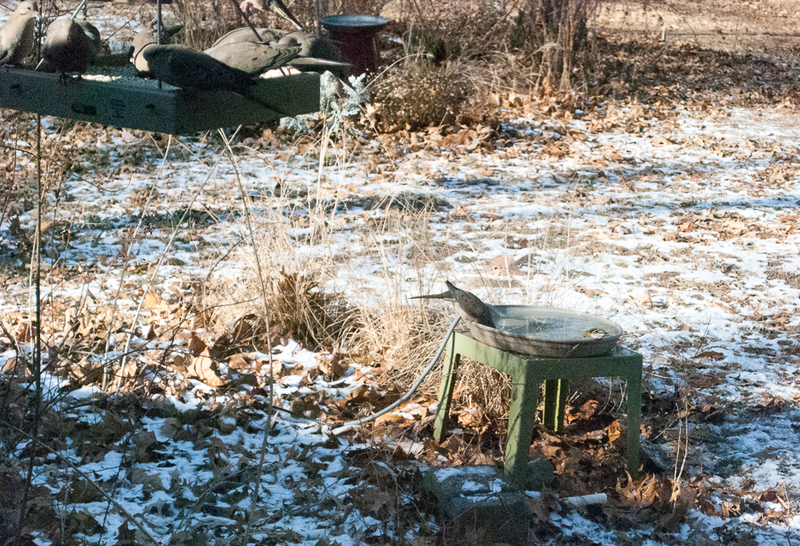 When everything else is frozen solid, a heated birdbath is a big draw for birds . . . and ok, also squirrels and neighborhood cats. Everyone is looking for a place to get a drink. * You need to keep an eye on them. I find that when the weather is especially cold, I need to top off or replace the water as often as every day. I think this is partly because there are so many creatures drinking from it, but I suspect that dry winter air pulling some water into the air may have a part as well. I have a large plastic pitcher that I use to fill bird baths in the winter when the hoses are turned off. This past week, the temperatures have been as low as 3 degrees F and I often see steam-like wisps coming up off the water when it has been newly filled, even when the water I’m using is inside room temperature. Although it looks like it is steaming hot, it isn’t. I think this is the water wisping up into the dry air. * When it is really cold, a de-icer, whether separate or built into the bath, can be really challenged to keep all the water ice-free unless you keep the bath full. A de-icer that is separate from the bath itself (like the one shown below) may not be able to keep the water ice-free if there is not enough water in the bath to cover the de-icer itself. Ice can form in shallow water that is farthest away from the de-icer. If that happens, add more water and it will melt again. Keep in mind that the need to keep enough water in the bath can mean that while the bath is shallow enough for larger birds to actually bathe in, the smallest birds might just use it to drink and not bathe. A de-icer that is built into the bath (like in the deck-mounted bath shown above) can still get icy around the edges if the water gets low and it is very cold. I found this week that if I didn’t keep it topped off, a crust of thin ice would form on the water surface along the inside edge of the bath, although the water at the center stays clear. Again, keeping the bath full to the top keeps the water ice-free. * With so much activity, I also find I need to clean bird baths more often than in warmer months. I use a sturdy bird bath brush to quickly scrub the inside of the bath, dump the dirty water and then re-fill. It only takes a minute of two about every other day. I have six bird baths of various types in warmer months but not all of their locations lend themselves to heaters, so I have three going during the winter, each a different type. 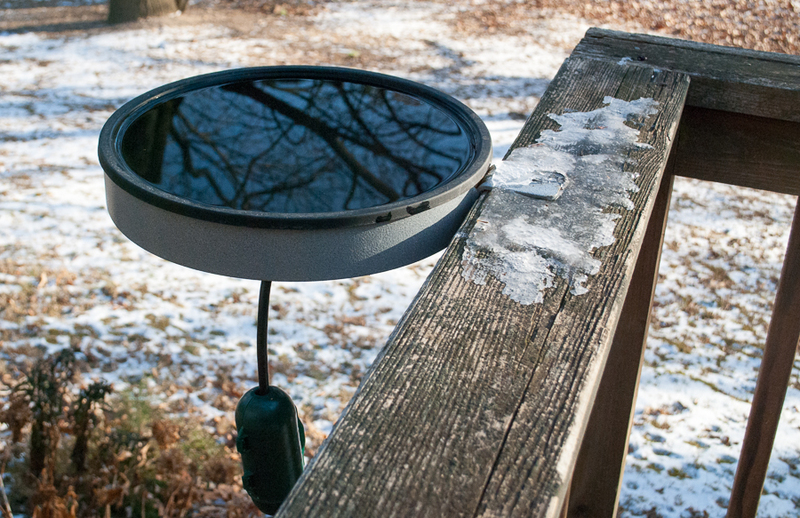 The first is an improvised DIY bird bath I made out of a very large plastic plant saucer and a bird bath de-icer. I wrote about this combination in a post a couple years ago. The de-icer is thermostat controlled so it keeps the water from freezing but doesn’t let it get overly hot, even if the winter day gets a bit warmer. I originally had this bird bath directly on the ground where it was very popular. But this fall, some critter (which I never did see) started using the birdbath every night to wash something (dirt-covered food, dirty paws? I don’t know.) Each morning would find it with a thick layer of dirt over the bottom of the bath. Tired of having to clean it out every morning, I finally put it up on a little cheap table we had in the garage. That stopped the problem and the birds still come to it. It also gives the birds a little more of a vantage point to keep an eye out for the neighborhood cats that I can’t seem to keep out of our yard. The table doesn’t look great but I’ll replace it with something that looks better eventually. 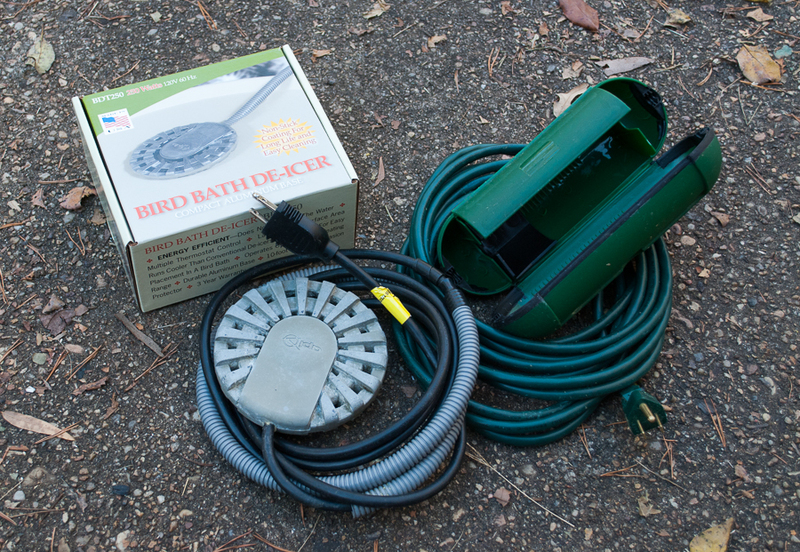 I also purchased a commercial heated birdbath this year, the Erva BA1H Clamp Mount Heated Bird Bath. 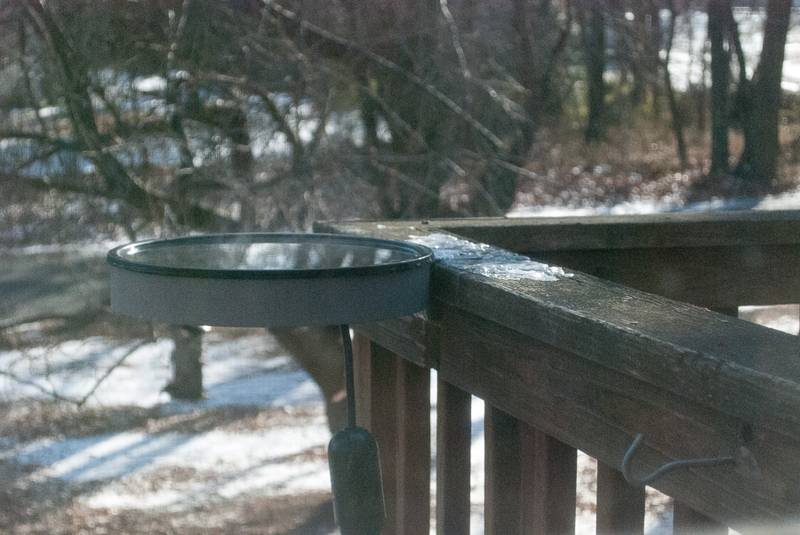 It has a metal deck mount that serves as a collar to hold the bird bath so that it hangs off the side of a deck railing. We have it on our front deck. My husband needed to do a little surgery to our deck railing because it was too thick for the clamp that grabs the railing. Again, I bought this one at our local bird store, Mother Natures. Local birding stores seem to be a good place to find Erva products, although you can sometimes find them on Amazon. At the store, I could purchase the bath with either a simple plastic insert for warmer months or a plastic insert that has a plug attached so you can heat it. The inserts were available separately at the store so I bought both, making it an all-weather solution. In the spring, I’ll swap out the heater insert for the unheated one. Note: Amazon also sells a Farm Innovators BD-75 3-in-1 Heated Birdbath, 75-Watt, Terra Cotta Color that looks similar to the heated version of the Erva birdbath. It includes mounts for a post or a deck or a stand if you want to put it on a table or the ground. It currently has a lower price than the Erva bath and is available with free shipping. Because it is not the one I have though, I can’t judge its quality. 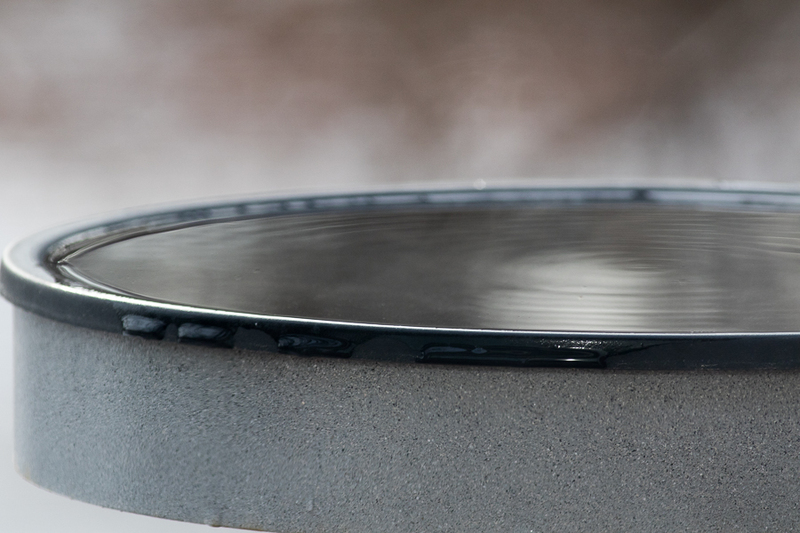 Like the de-icer, these birdbaths also need an outdoor electrical outlet with a GFCI (Ground Fault Circuit Interrupter.) The Erva deck mount bath I got comes with a very short cord, so I needed a short outdoor extension cord even though it is only about eight feet from the outlet. Also like the de-icer, I protect the area where the cords connect with a cord cover as I did with my other bird bath cord. I’ve been using this birdbath for several months and it is doing well. It is very shallow (less than 2″ deep), so it is nice for birds of various sizes to bathe in. It is popular for drinking as well. Because it is so shallow, it needs to be topped off often in the winter. So, to try and deter the cats, I got this deck-mounted bird bath, thinking that if the cats sat up on the railing by the bird bath, the birds would see them and stay away and if they sat down below the bath on the deck side, the birds could fly before the cat could jump up on the railing to get them. I am happy to say, that while an occasional cat will hop up on the railing to take a drink, they don’t camp out on the front step anymore, giving the birds (and me) a bit more peace. My third heated bird bath isn’t really a bird bath. It is a heated pet bowl. It has a medium length cord and is much deeper than a typical bird bath. It is not thermostat controlled, so if you let it get low or keep it plugged in on warm days, the water can get hot. I suspect that if you let this one sit empty plugged in, it would probably burn itself out. I do have this one on a GFCI circuit which I believe would cause the outlet’s switch to trip if this happened. These, or something similar, can be found at some pet stores or on Amazon. The one I am using now was purchased at a Petsmart store and has lasted many years. This particular “birdbath” sits on the back step under a bench. In this location, it is popular with squirrels and cats but also with the Carolina Wrens for some reason. It’s deep, so most birds will only sit on the side and take a sip, but one year I had a whole group of American Robins take turns bathing in it during a wintery day. When it is really cold, I need to top it off every day. 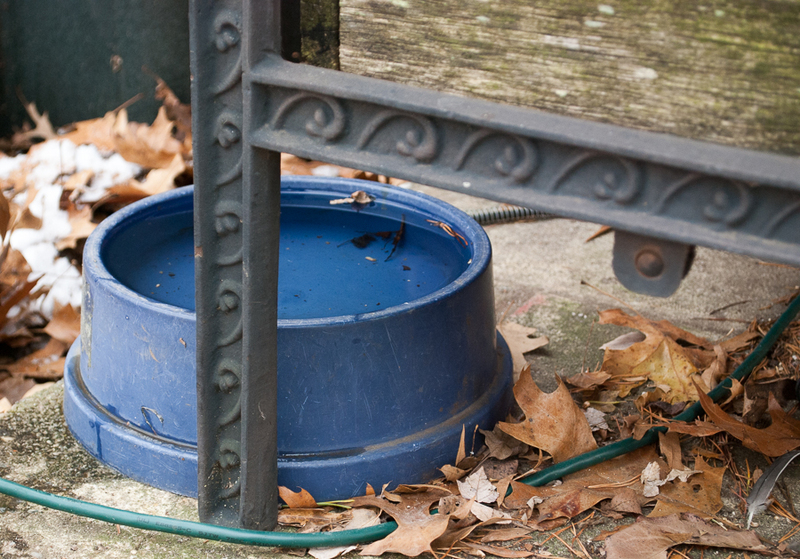 Because of its location, most of the birds do prefer one of the other birdbaths, but because cats and squirrels are more likely to use this one, they leave the other baths alone a bit more. 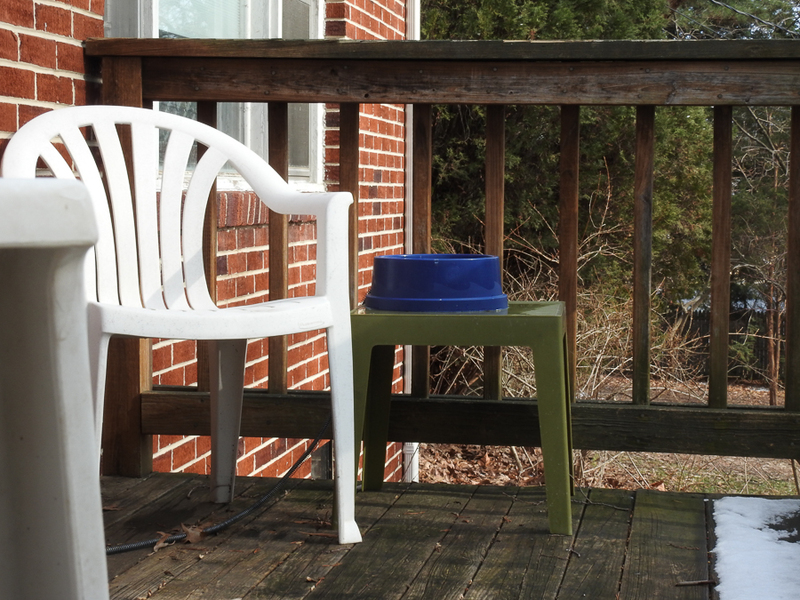 Until this year, I had a second one of these on a small table on my front porch that did get a lot of bird activity. Get A Heated Bird Bath! 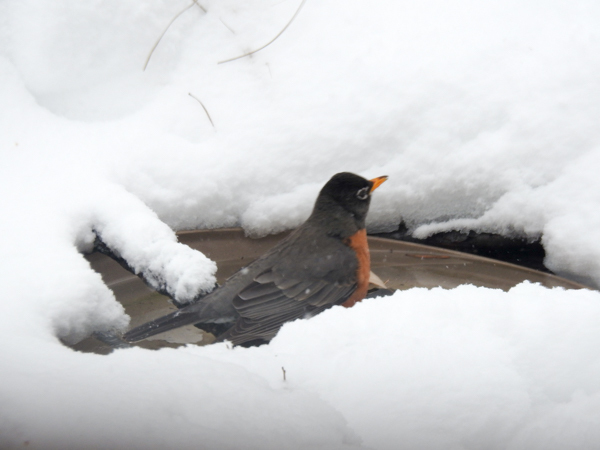 Whichever way you decide to go, consider providing a heated bird bath for your backyard birds. They will greatly appreciate it! Note: Please pardon the photos in this post, which are a mix of old and new. I dropped my favorite birding camera (a Nikon Coolpix p900) and had to ship it to Chicago to be repaired, so I’ve been making due with an older camera without as much reach so I had to scrounge a bit for photos this time! ← Will Birds Find My Feeder? Wow great post! These birdbaths are so great! I will definitely be looking into these for my birdies! Thanks so much, I learned so much from your post, as always!! Thank you! Thank you for sharing all the great tips for providing water for the birds in winter. I always enjoy reading about your birding adventures!